What is a Blackbaud ID and how is it created? Your Blackbaud ID is the email address you use to securely access your Blackbaud ID profile, some Blackbaud solutions, and Support resources. For more information, see Blackbaud ID. You should invite any staff member at your organization to create a Blackbaud ID when they need access to Blackbaud resources, such as Training and Support. Users and admins create their own Blackbaud ID when the invitation is received. To quickly gain access to Blackbaud resources, accept it in a timely manner. For more information see Add user and Add admin. We are new to Blackbaud. Who is our first organization admin? Typically, the first admin at your organization is the person who signed the contract with Blackbaud. Tip: The first admin receives a unique email from Blackbaud that invites them to create their Blackbaud ID. Once complete, they can add other admins and new users. What can the admin do at my organization? This admin has the ability to change your organization's profile, set security for others, set up single sign-on (SSO), and configure environments. For more information, see Admin Tasks. How do I add and invite more admins? To add and invite a new admin at your organization, see Admins. When you add a new admin, you enter their name and email address to invite them to your organization. Once the invitation email is accepted, the admin has access to features and tasks on Blackbaud's website, including the ability to change your organization's profile, set security for others, set up single sign-on (SSO), and configure environments. They can also view their Blackbaud ID profile and other resources, such as Training and Support. Note: For security reasons, Support cannot add new admins for your organization. Admins at your organization must add and manage other admins. How do I add and invite users (non-admins) to Blackbaud's website? To add and invite a new user, see Users. When you add a new user, you enter their name and email address to invite them to your organization. Once the invitation email is accepted, the user has access to Blackbaud's website so they can view their Blackbaud ID profile and other resources, such as Training and Support. Note: For security reasons, Support cannot add new users for your organization. Admins at your organization must add and manage users. This includes adjusting security for users and making them inactive. All users can view a list of admins at your organization on their Blackbaud ID profile under Organization contacts. Tip: To provide the user with access to a Blackbaud solution, go to that solution to provide the security they need. What does the invitation process look like for a new user or admin? Note: The content in invitation emails varies depending on the recipient (for example, an admin at your organization versus a user without admin rights), but the process is the same when they create a Blackbaud ID. After you add a new user, they receive an auto-generated invitation email to access Blackbaud's website. In the email, they must select Accept invitation. 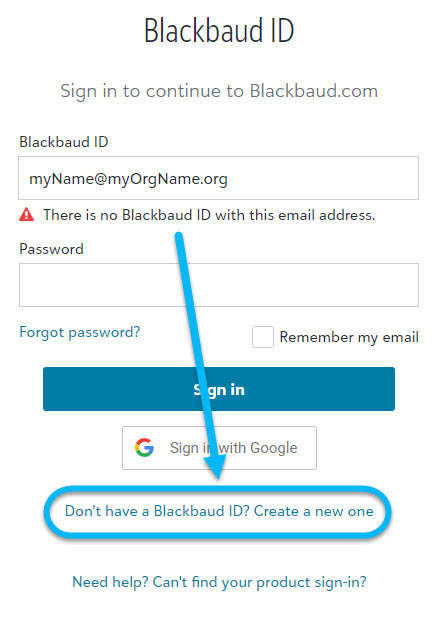 A Blackbaud sign in page appears with a link for the user to create their Blackbaud ID. After the user creates their Blackbaud ID, they receive a second, auto-generated email to verify their email address is correct. In this email, they must select Confirm email within 24 hours. Tip: To successfully sign in, users must confirm their email address within 24 hours of receiving the email. If a user signs in without doing so, or if their email confirmation expires, they're prompted to resend the email. The user can then sign in to Blackbaud's website for the first time. When the invitation or confirmation emails expire, the user or admin is prompted to resend the applicable email when attempting to sign in to Blackbaud's website. What happens when the invitation or confirmation emails expire? When the Blackbaud ID invitation or confirmation emails expire, the user or admin is prompted to resend the email when attempting to sign in to Blackbaud's website. How do I resend an invitation to Blackbaud's website? You can only resend an invitation if the user hasn't accepted it. For more information, see Resend invite. If you inadvertently sent one to the wrong email address, you need to cancel it. For more information, see Cancel invite. How can I help users sign in to Blackbaud's website? When a user receives an invitation, they accept it and create their Blackbaud ID credentials. After that, they can go to Blackbaud's website and select Sign in to access Blackbaud resources. If a user encounters issues receiving their invitation, review Issues with Blackbaud ID? with them. Can Blackbaud IDs be shared by multiple staff members? For security and account management purposes, each user should have their own unique Blackbaud ID. Don't share a Blackbaud ID email and password between multiple users. We aren't receiving emails from Blackbaud. What should I do? To troubleshoot receiving emails from Blackbaud, see this Knowledgebase article.